Crime is still king in the latest installment in the open world action game series, but players get more life simulation elements and activities amid three main character storylines. Set in the fictional world of Los Santos, Grand Theft Auto V (on PlayStation 3) is worth the purchase in replay value alone. Some graphic snafus and online version issues spoil the experience at times, but the overall freedom of discovery and role-playing elements overshadow the technical problems. Tennis, golf, scuba, shooting, yoga, triathlons, jet skiing, and base jumping are great recreation activities that also develop character skills. The AI improves on the law enforcement side (don’t expect an easy escape), but the character AI confuses at times and can cause some frustration. Some clipping issues also still exist (e.g. guns poke through walls and doors) and the white colored aiming dot for shooting weapons gets lost when aiming in light-colored backgrounds. Players can access vehicles by land, sea, or air, which produces some interesting new scenarios. Players can switch among the three characters any time though their special abilities are limited. Expert driver Franklin is a former street gangster looking to expand his horizons. Michael De Santa is an ex-con with a family in semi-retirement with a special ability in for precise actions while expert fighter/defender Trevor showcases fiendish behavior. Several characters cross paths across main plots, missions and other tangents at several different times during the game, which produces a nice element of anticipation and unpredictability. Themes of economic uncertainty set up the overall heist theme, which expands into amazing strategy options involving planning and successfully executing robberies with a team. The improved melee actions, add-on content, surprising discoveries, and extensive music soundtrack expand the experience even more. 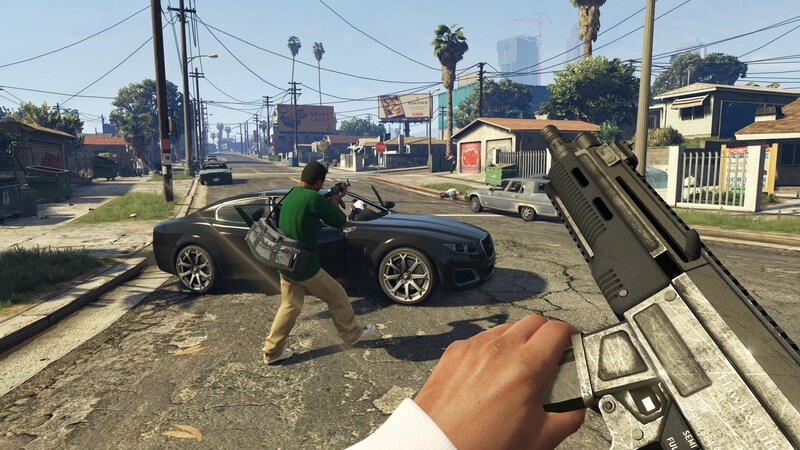 The Grand Theft Auto Online mode features 2 to 16 players in co-operative and competitive play plus friend invite in options, voice chat, leader boards and the standard lobbies/matching features. Developed by Rockstar Games and published by Take Two, Grand Theft Auto V makes no apologies for what it is and represents plus they’ve fixed most of the bugs and glitches. Most players know what to expect from this rated M for Mature game series that continues creating content full of alcoholic references, innuendo, profanity, sexual advances, stereotypes, threats, and misogynistic elements. A highly recommended game (****) that is also available on PC (with impressive 60 fps graphics) plus PS3, Xbox One and Xbox 360 with special editions and bundles for both consoles. This entry was posted in Video Game Reviews and tagged Grand Theft Auto V, Michael Siebenaler, Mike Siebenaler, Tall Writer, video games. Bookmark the permalink.